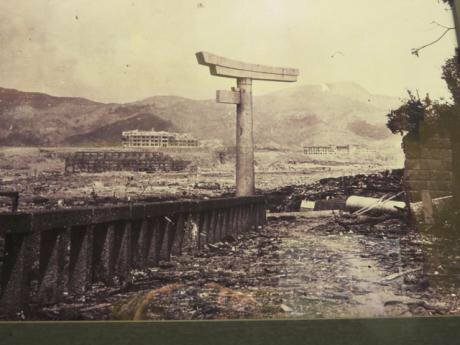 Today is the 71st anniversary of the bombing of Nagasaki on 9 August 1945. Last week I was in Nagasaki, participating in a symposium on nuclear issues organised by Asahi Shinbun, Japan's second largest national newspaper. I met several survivors of the Nagasaki bombing (known as Hibakusha), including Michiko Kano, whose son has just published a book about her experiences "15 year old Hibakusha: So as not to erase history". The death toll of 74,000 only counts those killed in the initial blast and first few days after the plutonium bomb "Fat Man" exploded at 11.02 that hot summer morning in 1945. But in the next five years Nagasaki lost a further 75,000 people due to bomb-related injuries, radiation sickness and various forms of cancer, with the youngest hit hardest. That one atomic bomb – less than one fifth of the explosive power of an average warhead for Trident – killed more than half of Nagasaki's population of 240,000 at the time. Another survivor, Masahiko Moriguchi, who was only seven when the plutonium bomb destroyed his home, gave me a warm hug and some leaflets calling on the US and Japanese governments to make a commitment to "no first use" of nuclear weapons. Both his sisters as well as almost all his classmates were killed. One sister died from acute radiation sickness and the other from radiation-induced cancer a few years later, a tragic reminder that nuclear weapons carry on killing long after the explosion has faded. I first met Moriguchi in 2007 at Faslane nuclear base. He had felt so strongly that Britain should not replace Trident that he travelled to Scotland to take part in the year-long "Faslane 365" protests. 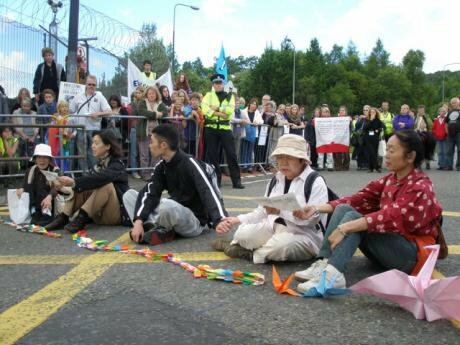 Together with others from Hiroshima and Nagasaki, including his elder brother and son, he linked arms and sat down in front of the Faslane gates, gently singing. He and his brother were arrested and briefly imprisoned in Clydebank cells after Strathclyde police dragged them away to let the military transporters through. Now Moriguchi wanted to know what was happening about Trident replacement. I explained that the new Prime Minister Theresa May had received a majority for a government decision in a partisan vote in July. "Does this mean we failed to stop Trident?" he asked anxiously. I told him that I hoped not, that the rational and security arguments against nuclear weapons made by the Scottish MPs, Greens and some Labour MPs, including the Labour Party leader would be proved right, but unfortunately not before the UK government wasted billions of our hard-earned money on replacing Trident. I urged him to keep campaigning for nuclear weapons to be prohibited and abolished, as this is the most likely route to success now. 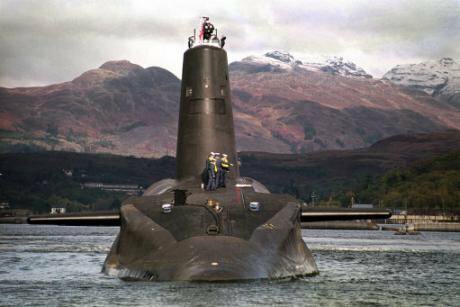 Though the weight of the Westminster Parliament's votes gave Trident the go ahead, Britain is likely to give up nuclear weapons long before the first Successor submarine is actually built. There are two major reasons for this assessment, both of which were raised by opponents of the government decision. These are: international humanitarian initiatives to negotiate and bring into force a universally applicable Nuclear Ban Treaty; and Scotland's desire to become nuclear free and independent. These salient trends are already coming together in a pincer movement likely to render Trident's successor not just pointless but impossible. 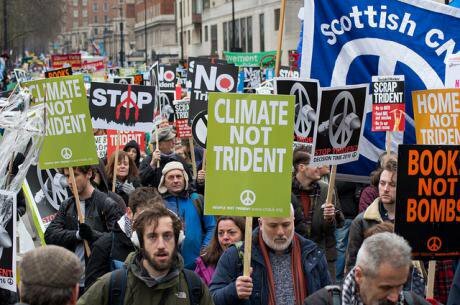 Scottish and humanitarian opposition to Trident were amply demonstrated in the Trident debate and vote. Ending Scotland's role in Trident deployment may be the starting point for MPs representing the Scottish National Party (SNP), but together with the Greens and Labour leadership and handful of Liberal Democrats and others, they clearly want to prohibit and eliminate all such weapons. Moreover, these MPs were more aware and knowledgable than the majority of Trident advocates about multilateral and humanitarian initiatives to ban nuclear weapons, including the UN Open-Ended Working Group on multilateral disarmament that has been holding talks in Geneva this year. Last week Ambassador Thani Thongphakdi, Chair of the UN Working Group, issued his initial draft report text for feedback and discussion before it is finalised by 19 August. The working group was established to address "concrete effective legal measures, legal provisions and norms that will need to be concluded to attain and maintain a world without nuclear weapons" as contained in the mandate contained in UN General Assembly resolution70/33, entitled "Taking forward multilateral disarmament negotiations", adopted in December 2015. Britain was one of only 12 UN member states to oppose this resolution, while 138 voted in favour, with 34 abstaining. Convened in February, May and with one session to go in August, the Working Group deliberations were the centrepiece of multilateral disarmament talks in 2016. They proved to be thoughtful, substantive and significant, despite a handful of boycotts from States that had been out-voted, including the UK. Yet, judging from Westminster's Trident debate, the Prime Minister and most government spokespeople and elected members of parliament are either woefully ignorant or in ostrich-like denial of the existence of these multilateral disarmament talks, let alone their content. In accordance with the Working Group's mandate, the Chair's draft report summarised various kinds of legal measures and provisions that were put forward. Recommending that "additional efforts can and should be pursued to elaborate concrete effective legal measures, legal provisions and norms that will need to be concluded to attain and maintain a world without nuclear weapons," the draft report concluded that "a majority of States supported the convening by the General Assembly of a conference in 2017, open to all States, international organizations and civil society, to negotiate a legally-binding instrument to prohibit nuclear weapons, leading to their total elimination." The report acknowledged that a group of States considered that such negotiations would be "premature", and "supported the pursuit of practical building blocks consisting of parallel and simultaneous effective legal and non-legal measures". But they were a relatively small minority. When Ambassador Thani convened a meeting on 5 August to start debating the draft, delegations from Austria and Ireland joined members of the Non-Aligned Movement and Nuclear Weapon Free Zone treaties in insisting that the will of the majority should be strongly and accurately reflected in the Working Group's report, especially the support for negotiations on a new legal instrument or treaty to commence in 2017. The majority has rejected arguments from some NATO states that prohibiting nuclear weapons would not be consistent with existing agreements like the Non-Proliferation Treaty (NPT). On the contrary, the majority argued that a nuclear prohibition treaty would reinforce the non-proliferation regime and could be negotiated in parallel with efforts to universalise and fully implement the NPT, as well as other kinds of steps, such as further bilateral and unilateral reductions to existing arsenals, and ongoing efforts aimed at entry into force of the Comprehensive Test Ban Treaty (CTBT), which still requires certain states such as the United States, China and India to ratify. As senior Japanese ministers and government officials joined in commemoration ceremonies in Hiroshima and Nagasaki, Prime Minister Shinzo Abe's government has been trying to be all things to all people – an advocate of nuclear disarmament when facing public opinion in Japan, while backing American deployments of nuclear weapons and doctrines that include a long-standing US threat to use nuclear weapons first in conflict situations. The Hibakusha and much of Japan's civil society strongly support a nuclear ban treaty, as proposed by the International Campaign to Abolish Nuclear Weapons (ICAN), and would like to see Japan and the United States adopt a "no first use" position. Yet in the UN Working Group in Geneva, Japan has joined with South Korea, Australia and most if not all NATO members to try to prevent negotiations on a new legal instrument to prohibit nuclear weapons, as a viable next step in multilateral disarmament. Three recent developments show the position of these "nuclear umbrella allies" to be increasingly untenable. First came speculation from Washington that President Obama was considering making changes to US nuclear doctrine and policy by executive order, before he leaves office in January 2017. The most prominent shift being was reportedly a declaration of no first use, which caused great excitement in Japan. News reports that Prime Minister Abe had expressed opposition to any US shift towards a 'no first use' doctrine sparked media and political criticism, with petitions calling for the Japanese government to represent the will of the people by giving whole-hearted support to any US initiatives to give a no first use undertaking. Second, the recent coup in Turkey demonstrated the validity of concerns about nuclear weapons safety and security that were raised by speakers at the international conferences on the humanitarian impacts of nuclear weapons held in Oslo, Nayarit and Vienna in 2013-14. Though the 50 US nuclear weapons stored by NATO at Turkey's Incirlik nuclear base were not directly involved in the recent coup, those events – and growing terrorist attacks in Belgium and Germany – have led to the US government facing renewed calls to withdraw its remaining nuclear weapons from European bases due to their vulnerability. In one example, the prestigious Nuclear Threat Initiative noted that "the 'expert' assumptions about the safety and security of U.S. nuclear weapons stored abroad can change literally within minutes, adding another layer of security concern," and asked: "Can Washington take steps to reduce these threats by removing tactical nuclear weapons from Europe before an incident occurs and leaders are asked why they didn’t do more sooner?" Third, while nuclear-armed States like Britain, the United States and France have so far refused to participate in the UN talks on multilateral nuclear disarmament, senior officials in these three capitals have privately told academics that they now regard a nuclear ban treaty as "inevitable". Notwithstanding their opposition to the idea, some if not all the nuclear armed states appear now to be coming to terms with the assessment that they cannot prevent such a treaty being negotiated by a majority of States under International Humanitarian Law. Some have spoken of looking at contingency plans if such a treaty undermines their ability to keep deploying nuclear weapons. Such contingency planning was practically absent from the Trident debate, but should still be undertaken by the government before signing the multi-billion pound contracts to "cut steel" for the submarines. At the very least, fiscal and defence prudence should dictate a delay in any irreversible financial commitments in order to evaluate the impacts of multilateral negotiations on a nuclear prohibition treaty, as well as the perceived "democratic deficit" in Scotland, where Trident as well as Brexit are major factors. In this time of post Brexit uncertainty and continuing austerity measures, with hundreds of thousands of jobs in all sectors put at risk, the issue of Trident jobs was hotly contested. With an estimated 11,500 jobs associated with Trident, the £31 billion price tag for four nuclear submarines (not even counting the extra £10 billion contingency fund earmarked by the Chancellor and MoD last year) will eat up more than £2.5 million of public money per worker employed. This is what 472 MPs voted for, defying any kind of economic or security sense. Invested in other manufacturing sectors, health, education or sustainable energy production, that level of public funding would save or create far more jobs, skilled and unskilled. The writing is on the wall. Carol Monaghan, an SNP MP whose husband is a former submariner who test fired Trident missiles (and now opposes Trident replacement), underscored: "We support the personnel working on these submarines absolutely 100%, but not all of those personnel support the weapon they have been asked to deliver." Yet despite Trident replacement becoming less and less viable due to the foreseeable international and Scottish developments as well as economic challenges, remarkably few MPs were prepared to argue for the government to develop contingency plans, including diversification and reskilling for workers who could be affected if Britain does not continue to make and deploy further nuclear weapons. Though the escalating costs of Trident, democracy and jobs were important in Scotland, the principal argument against Trident was, in the words of Angus Robertson, the Westminster Parliament's SNP Leader, that it is an "immoral, obscene and redundant weapons system". This, together with the apparent inability of nuclear-armed states to reduce their nuclear dependency of their own volition, is why the majority of UN Member states are now backing multilateral negotiations to commence in 2017 on a globally applicable Nuclear Ban Treaty. 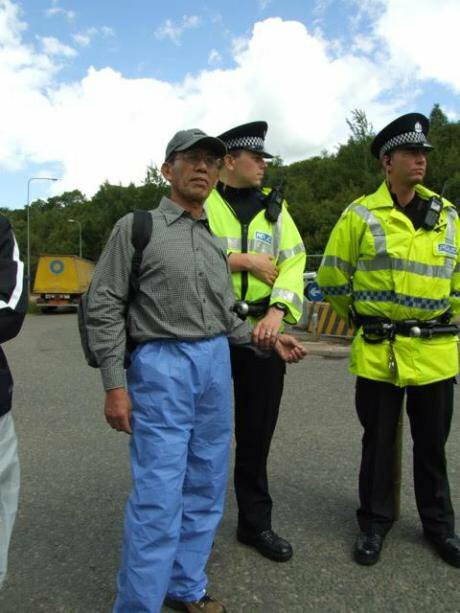 This is why survivors of the Nagasaki and Hiroshima bombings, including Masahiko Moriguchi, have joined Trident Ploughshares protests at Faslane and Burghfield. And this is why I reassured this courageous Hibakusha in Nagasaki that we have not failed to stop Trident, though the Westminster vote was a setback.